BACKGROUND: this paper is based upon work from COST Action ICSHNet. Health risks related to living close to industrially contaminated sites (ICSs) are a public concern. Toxicology-based risk assessment of single contaminants is the main approach to assess health risks, but epidemiological studies which investigate the relationships between exposure and health directly in the affected population have contributed important evidence. Limitations in exposure assessment have substantially contributed to uncertainty about associations found in epidemiological studies. OBJECTIVES: to examine exposure assessment methods that have been used in epidemiological studies on ICSs and to provide recommendations for improved exposure assessment in epidemiological studies by comparing exposure assessment methods in epidemiological studies and risk assessments. METHODS: after defining the multi-media framework of exposure related to ICSs, we discussed selected multi-media models applied in Europe. 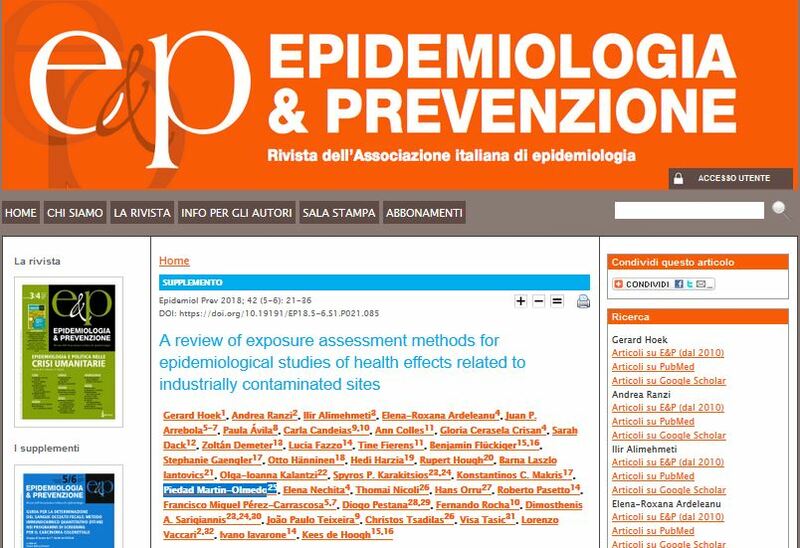 We provided an overview of exposure assessment in 54 epidemiological studies from a systematic review of hazardous waste sites; a systematic review of 41 epidemiological studies on incinerators and 52 additional studies on ICSs and health identified for this review. RESULTS: we identified 10 multi-media models used in Europe primarily for risk assessment. Recent models incorporated estimation of internal biomarker levels. Predictions of the models differ particularly for the routes ‘indoor air inhalation’ and ‘vegetable consumption’. Virtually all of the 54 hazardous waste studies used proximity indicators of exposure, based on municipality or zip code of residence (28 studies) or distance to a contaminated site (25 studies). One study used human biomonitoring. In virtually all epidemiological studies, actual land use was ignored. In the 52 additional studies on contaminated sites, proximity indicators were applied in 39 studies, air pollution dispersion modelling in 6 studies, and human biomonitoring in 9 studies. Exposure assessment in epidemiological studies on incinerators included indicators (presence of source in municipality and distance to the incinerator) and air dispersion modelling. Environmental multi-media modelling methods were not applied in any of the three groups of studies. CONCLUSIONS: recommendations for refined exposure assessment in epidemiological studies included the use of more sophisticated exposure metrics instead of simple proximity indicators where feasible, as distance from a source results in misclassification of exposure as it ignores key determinants of environmental fate and transport, source characteristics, land use, and human consumption behaviour. More validation studies using personal exposure or human biomonitoring are needed to assess misclassification of exposure. Exposure assessment should take more advantage of the detailed multi-media exposure assessment procedures developed for risk assessment. The use of indicators can be substantially improved by linking definition of zones of exposure to existing knowledge of extent of dispersion. Studies should incorporate more often land use and individual behaviour.